Dazzling light shows don’t get any easier to achieve than with the Rotosphere Q3. 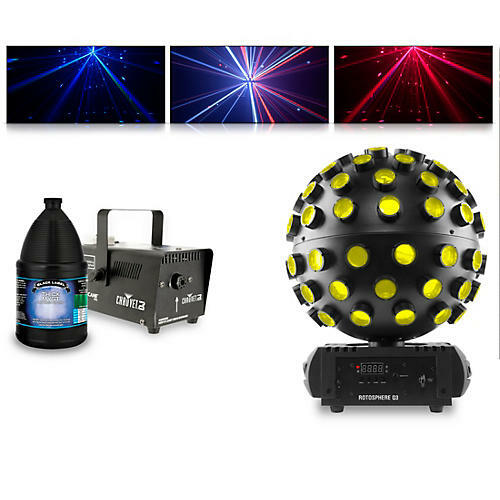 This user-friendly mirror ball simulator from Chauvet is ready to go right out of the box and can be truss-mounted or simply placed atop a stand. With its powerful and efficient quad-color LEDs and three different LED zones, the Rotosphere Q3 can emit up to 3 different colors of room-filling beams simultaneously. The simple digital display lets you select colors, choose the operation mode and adjust the rotation speed for the mood you want to set. Operating the light can be as simple as using one of its built-in automated programs or sound-activation mode. But with DMX capability, multiple Rotosphere Q3s can be linked together for maximum control and creativity. Factor in the unit’s compatibility with the optional IRC-6 wireless remote and you have one seriously potent and versatile lighting tool at your disposal.